President Donald Trump is considering several women as potential high court nominees. Here are half a dozen currently viewed as top candidates for the slot. WASHINGTON — President Donald Trump's short list of contenders to succeed retiring Supreme Court Justice Anthony Kennedy includes two women, he has said, and that could have powerful implications not just for the law but the politics surrounding the choice. There are six women among the 25 possible nominees Trump has publicly named already, including a federal appellate judge, Amy Barrett, and a Georgia Supreme Court justice, Britt Grant, who were put on the list late last year. If one of the women is chosen and confirmed, she would become the fifth woman in history to serve on the court and the fourth among the current lineup of justices, joining Ruth Bader Ginsburg, Sonia Sotomayor and Elena Kagan, all of whom were appointed by Democratic presidents. And, important to both sides on the political spectrum, Trump's nominee, if it's a woman, would be the first appointed to the court likely to thrill hard-line conservatives. Justice Sandra Day O'Connor, who was nominated by President Ronald Reagan, rankled the political right by refusing to upend the controversial Roe v. Wade decision that overturned state laws banning abortion and sometimes siding with the court's liberals on other issues. Trump may find irresistible the temptation to nominate Barrett, who deeply endeared herself to conservatives during a nomination battle to the 7th Circuit Court of Appeals when she went back and forth with Sen. Dianne Feinstein, D-Calif., over aspects of Barrett's Roman Catholic faith. Barrett "already went thru the meat grinder in her confirmation hearings and was fantastic," Laura Ingraham, a Fox News host and former law clerk for Supreme Court Justice Clarence Thomas, wrote recently on Twitter. "She'd be a phenomenal SCOTUS Justice." Barrett, 46, is the newest justice on the 7th U.S. Circuit Court of Appeals, having been confirmed by the Senate, 55-43, in October of last year. She received support from Democratic Sens. Joe Donnelly of Indiana, Joe Manchin of West Virginia and Tim Kaine of Virginia, all of whom are up for re-election in 2018. Missouri Democratic Sen. Claire McCaskill, one of the most politically vulnerable incumbents in the country, did not vote on her confirmation. Barrett, a professor at the University of Notre Dame law school, excites conservatives for the very same reason liberals are wary of her: a possible battle over her Catholic faith and whether it would inform her decision-making on abortion and other social issues. Liberals may be particularly concerned over Barrett's affiliation with a charismatic Christian group called People of Praise. "The dogma lives loudly within you," Feinstein, who is Jewish but attended a private Catholic high school, charged during Barrett's confirmation hearing. Barrett assured senators that she would rule according to the law and not her personal beliefs, and conservatives cried foul, arguing that Democratic lawmakers were improperly applying a religious test to the nominee. Marjorie Dannenfelser, president of the anti-abortion group Susan B. Anthony List, told NBC News that "a woman like Barrett ... would be a welcome addition" to the court. "She is respected by pro-life movement leaders and grass roots, and beloved by her students — having been thrice named 'Outstanding Professor of the Year' by Notre Dame graduates," Dannefelser said. "More important than gender, however, will always be a nominee's approach to the Constitution." At 40, Grant is the youngest of the women on Trump's list, meaning she could serve several decades on the Supreme Court if she were to be nominated and confirmed. She currently serves on the Georgia Supreme Court, and her nomination by Trump to the 11th U.S. Circuit Court of Appeals has been pending before the Senate since April. Her youth is a double-edged sword: While it gives Grant tremendous appeal in terms of potential longevity of service — Trump himself said he wanted someone who could serve 40-45 year — she's never been confirmed to a federal bench by the Senate. That means no senator who wanted to vote against her would have to flip-flop on prior support. But with a confirmation process that often involves demands by the opposition political party that high court nominees defend past rulings, her thin paper trail — which has left opponents citing her positions in friend-of-the-court briefs, but few actual decisions — could be a real asset. Larsen, 49, serves on the 6th U.S. Circuit Court of Appeals, having won Senate confirmation, 60-38, last year. Eight Democrats, including home-state Sens. Debbie Stabenow and Gary Peters of Michigan, voted to confirm her after an effort to stop her nomination from getting to a vote. 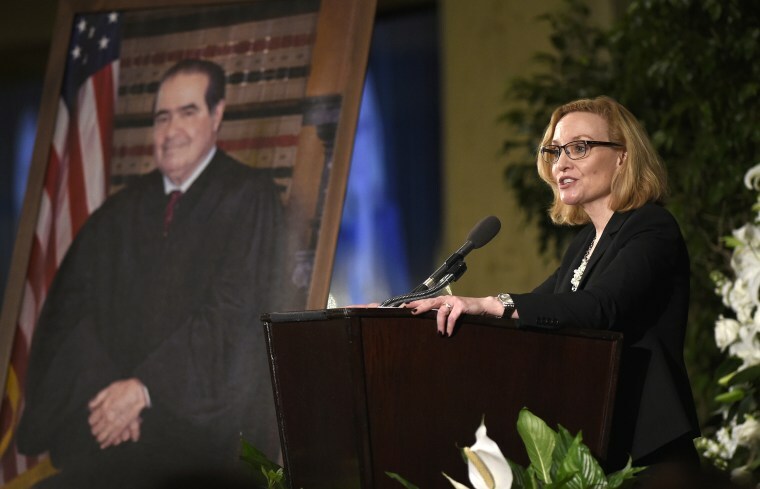 She previously clerked for Justice Antonin Scalia, the conservative icon who died in 2016, and worked as a lawyer in President George W. Bush's White House. Like Grant, she doesn't have many decisions under her belt, and she won over more of the Senate than Barrett did. Like several other women on the list, the 53-year-old Eid is a recently confirmed U.S. appellate court judge, having taken the spot vacated by Neil Gorsuch after he was confirmed to the Supreme Court last year. She won 56 votes, including those of Democrats Donnelly, Manchin, Heidi Heitkamp of North Dakota and Michael Bennet of her home state of Colorado. As a state Supreme Court justice for more than a decade, her list of rulings is longer than many other potential Trump picks. When she was nominated for the federal bench, The Denver Post noted that she would likely "echo" Gorsuch's "conservative approach to the law," citing dissents she wrote in favor of a school-voucher system, eminent domain actions by the city of Telluride and other matters. Eid, who was raised by a single mother and went on to clerk for Supreme Court Justice Clarence Thomas, has the kind of compelling personal story that a president's assistants love to tell during a confirmation fight. The 60-year-old Sykes stands out for the fire she's drawn from some conservative activists for sentencing anti-abortion activists to jail and ruling against an Indiana law that defunded Planned Parenthood. In 2004, at a time before confirmation votes were such political footballs, Sykes won the support of 70 senators, including 21 Democrats, to serve on the 7th U.S. Circuit Court of Appeals. But only three of those Democratic senators are still serving: Maria Cantwell of Washington; Tom Carper of Delaware; and Senate Minority Leader Chuck Schumer of New York. Ryan, 54, has a resume line Trump likes that no other woman on the list can boast: military service. Now a military judge, Ryan served in the Marine Corps, and later as a clerk to Thomas. Nominated by George W. Bush to the military's appellate bench, she was confirmed in 2006 in a unanimous Senate vote.